Bits and cutters of industrial and dental quality: Accessories. For all prepared MICROMOT devices. Advantageous when working with different shafts. 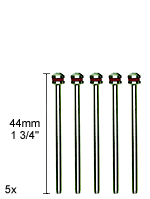 Capacity 0.3 - 3.2mm (1/64" - 1/8"). Drill chucks provide more convenience to quickly change the tools when working with shafts of varying diameters. However, because of their technical setup, they have a few drawbacks compared to collets: Less clamping force and higher concentricity tolerances. If high precision is necessary, then working with MICROMOT steel collets is a must. See also note to the left. Triple slit and hardened. 1 each of 1 - 1.5 - 2 - 2.4 - 3 and 3.2mm (1/32" - 1/16" - 5 /64" - 3/32" - 7/64" - 1/8"). With clamping nut and holder for storage. 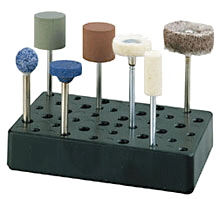 MICROMOT steel collets are hardened and thus have a high, consistent flexibility. They also maintain prolonged accuracy, even after regular use (these collets should not be compared with unhardened, four-slit collets of brass and aluminium). The triple slit collet is substantially more difficult to manufacture than the four-slit type, but offers a better load- bearing surface. 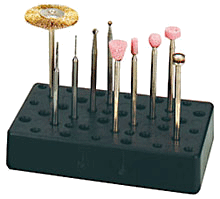 This is especially important for cutters with small shaft diameters. For the clean storage of micro drills, grinding bits, brushes and other rotating tools with shaft diameters of 2.35 - 3.2mm (3/32" - 1/8"). Without bits and cutters. Two pieces. For all rotating accessories of the MICROMOTsystem without shank, all mandrels Ø 2.35 x 44mm (3/32" x 1 3/4").